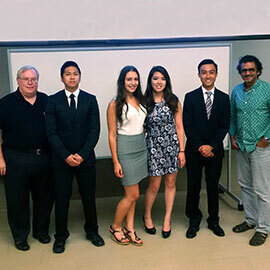 On July 14, the Lazaridis School of Business & Economics’ Business Technology Management (BTM) program held its second successful case@BTM case competition on Laurier’s Brantford campus. Open to all BTM students, the inaugural case@BTM Case Hack looked at the growth potential of a social media site and saw ten teams of four students vie for the top prize. Teams were given four hours to read the case, analyse, identify problems and solutions, and create a compelling 15-minute presentation. Afterwards, a judging panel of six faculty responded with 10 minutes of intense questioning. Case presentations were evaluated on the analysis of the case, solutions and clarity of key ideas as well as visual content and professionalism. Teams were divided into one of two streams: one for third-year students and another for fourth-year students. Winning students from the first stream included Matthew Raines, Simran Hayer, Leah Devos and Dante Edissi, all third-year students in the BTM program. Fourth-year BTM students Steven Thai, Maryemma Saddler, Carmen Cheung and Johnny Nguyen took home the win in the second stream. case@BTM was launched in spring 2015 by McMurray with the help of a Special Initiatives Fund Grant. McMurray wanted to establish a case competition infrastructure for BTM students of all years on the Brantford campus and develop an annual workshop schedule to incrementally build case analysis skills in participating students. For the past year, the BTM program has been running monthly case@BTM workshops, promising students a piece of pizza and the opportunity to augment their learning experience and develop case analytic skills. Topics ranged from teamwork, finance, strategy, and digital marketing to valuation methods, case attack strategies and providing peer feedback of informal case presentations. The two-hour evening workshops regularly had 20-25 students in attendance. In March, the BTM program held its first weekend-long event, case@BTM Case DeBug Competition, with 16 student participants. The quality of business case solutions and presentations was a strong endorsement for the commitment of the students and faculty involved.